WOULD YOU CALL THIS “SCIENCE”? The picture on page one tells its own story. The young sow struggled for hours in the snare until a local lady became aware of her plight. When she contacted Badgerwatch it was late Saturday afternoon. The snare had pulled so tight that it had become embedded in the animal’s lower abdomen and across the groin areas. Loose earth in the vicinity demonstrated her struggle for freedom.. To add to her misery, the snare had actually been set on a ditch. The local conservation ranger was notified but he did not attend. The Department of Agriculture’s badger trapper had not checked his snares that day. Indeed he did not arrive until lpm the following day - Sunday. A local vet was called to the scene but nothing could be done except to end the suffering. It could have been worse. She was not a lactating sow. Had she been, her orphaned cubs would have died of starvation somewhere underground, totally inaccessible. It would have been impossible to locate or indeed reach them. Badger trapping in this country, continues without respite, right through the badgers’ breeding season January-May. In response to a Dail question raised by Dail Deputy Tony Gregory on behalf of the Irish Council Against Blood Sports (ICABS) 27th February 2007 Agriculture Minister Mary Coughlan replied. “Most of the operational work involved is carried out by staff from the Farm Relief Service Co-op (FRS) who are closely supervised by staff from my Department. Obviously not close enough, Minister! For this, a “stopped restraint” ( lethal snare) of a type approved under Section 34(2) of the 1976 Wildlife Act is used.”. The (former) Minister goes on “each FRS staff lays and monitors between 60-100 restraints (snares) and at peak times there may be up to 6,000 restraints on farmland on any given night”. “All restraints (snares) are checked daily (incorrect) to ensure trapped animals do not suffer any unavoidable trauma. Captured badgers are humanely euthanized”. The common feature in almost every case over the years was that badgers get caught around the hind quarters as did our pictured sow. The more the animal struggles the tighter the wire becomes until it’s cut deep into the badger’s body causing horrendous damage to body tissues and much suffering to the animal. Without intervention our badger and God knows how many others could have suffered this trauma for forty eight hours awaiting the arrival of our good trapper from the Farm Relief Service! 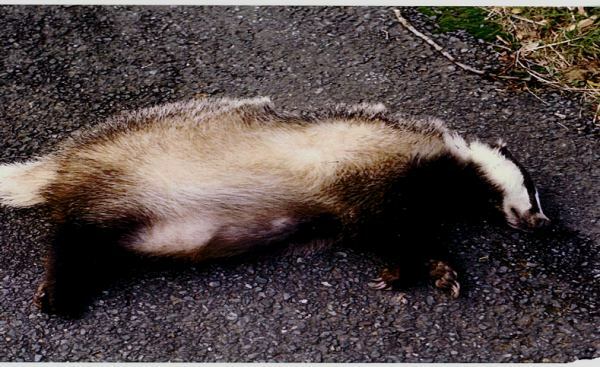 The Department would have us believe that the badger lies relaxed and content in the snare while it awaits its fate. Badgerwatch has been contacted by a number of people in recent weeks who’ve provided evidence to the contrary. We have in turn, made the Dept of Agriculture and the National Parks and Wildlife Service, (NPWS) aware of such of such matters and to date Badgerwatch has to date received the standard acknowledgement from both. departments. We await a full response. 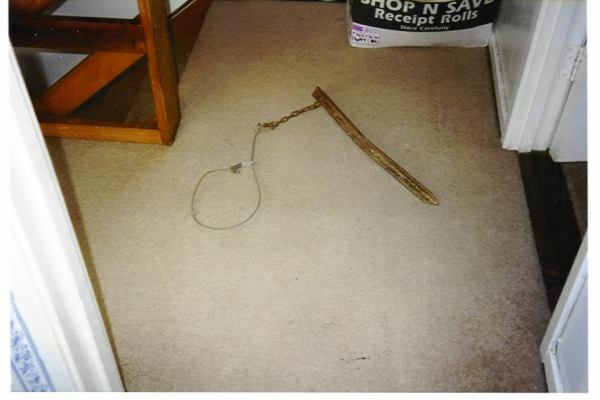 THIS IS THE STOPPED BODY RESTRAINT AKA THE MULTI-WIRE SNARE IDENTICAL TO THE ONE WHICH TRAPPED THE BADGER. Snaring began in 1985. Since 1995 approximately 53,000 badgers have been removed by trapping. 13,000 were also removed during the previous decade (1985-1994, inclusive) by the same method. Included in the above figures were 5,933 trapped in 2007. Driving along, I notice a dead body by the roadside. No one has stopped. know wrapped up in a fur coat but it has the signs of a hit and run..
was not missed. Convenient to say that badgers spread disease and don¹t feel like we do. Of course, we could equally say that we don¹t feel like we do. unique intelligence, praised God in his own way. Yet no Good Samaritan might be expected to stop to check his wounds or say a prayer. The Road Safety Authority would not add his death to their list. I was visiting my friends in Thomastown recently when 3 year old Naoise emerged from the garden shouting delightedly, O God¹s creature,¹ and showing us the ant in his hand. This, I thought, must be what it means to accept the Kingdom of God like a child. animals will have perished humans would die of loneliness. a particular revelation of divine presence. It is a soul-loss indeed. Bad news, now Wales has announced a cull of badgers as part of a plan to eradicate TB in cattle. The Welsh Assembly Government’s plan includes a one-off test of all cattle and a review of its compensation system.. following in Ireland’s footsteps, Welsh farmers have been pointing the finger of suspicion at Broc for the spread of BTB. Animal welfare groups say there’s no scientific evidence to support the claim. Badger Trust says the culling proposal by the Welsh Assembly Government (WAG) was sacrificial politics at its worst and had nothing to do with published, peer-reviewed science. A proposal by Minister Elin Jones sought to commit the Assembly to a pilot programme of killing badgers in Wales with the faintest idea as to : how much it would cost, what the benefit would be, where it would take place, who would do it or how it could be done. Elin Jones, Minister for Rural Affairs stated “ I am very aware of the strong views on this issue. I want to make it absolutely clear that the badger remains a protected species in Wales and the conditions of the Badger Act are firmly in force. Illegal action will not be tolerated”. Badger Trust has solicitors to seek permission of the High Court to commence judicial review proceedings against WAG for that decision to be quashed. .Declan Holmes, a Department of Agriculture official, gave evidence of interception the livestock belonging to McCooey at a premises in Meath. He said a trailer was driven off as they undertook a closer check. The vehicle was pursued to the village of Nobber where an inspection showed that some of the livestock ear-tags were tampered with. Michelle Flanagan, for the defence, said the defendant has subsequently apologised for what he had done and has since paid all the costs involved in the case. The recent clash between Prof. King and Prof. Bourne & the ISG before the EFRA Committee reveals just how surreal the badger cull debate has come, since neither side can “SEE” what the final report actually discovers. It has become “accepted wisdom” for so long that badgers are the reservoir of TB that everybody is interpreting cattle data in terms of badgers. This view is based explicitly on the idea that cattle to cattle transmission in unimportant so cattle are NOT the infectious source of TB for other cattle or badgers. This astonishing view has risen precisely because the whole point of annual cattle testing over the last 40 years has removed cattle before they reach the infectious stage. So at the low point nearly half the herd breakdowns had only 1 reactor and cases were found so early that in for example 1989 only 31% of herds were confirmed with TB (the rest had no visible lesions and so few M. Bovis that they were unconfirmed). This hidden reservoir was the real source of further TB but since there was seemingly no confirmed cattle source badgers got the blame. The steady rise of cattle TB since the mid 80’s has been because strict testing was relaxed first when MAFF was overstretched with BSE and then with the 2001 FMD with no testing, then a huge backlog. So confirmed new herds had doubled by 2002 and TB cattle rose 3 or 4 fold. The ISG failed to notice this so they interpreted cattle rises in TB as due to perturbed badgers and the falls as due to widespread proactively. The ISG’s own report also fails to notice just how few Tb badgers they had actually removed :- over the 7 years from 2000sq km there were ONLY 1515 TB badgers. 311 reactive and 1204 proactive and ONLY culled 166 infectious out of nearly 11,000 culled (p.77). These were clearly not a major source of TB nor a plausible cause of the rises/falls in cattle TB which resulted from relaxing/tightening cattle controls. Incidentally with a doubling in badger TB levels simply by spill over from cattle. CONFERENCE ON BOVINE TB AND ERADICATION. The objective of the seminar was for Irelands Department of Agriculture, Fisheries and Food (DAFF) to present information on developments in the control and eradication of TB in Ireland, with a particular emphasis on research. The ‘emphasis on research’ is a bit of a joke as the level of scientific research presented was of very poor quality, and probably reflects why there is a lack of published Irish research in peer reviewed Journals. Indeed, the most scientific presentation was given by a Chilean (Francisco Olea-Popelka) who was at a Canadian University! Here is present a review of the seminar. A review of TB policy and the introduction of a large cattle testing regime. By increasing the number of cattle tests they discovered that there was probably twice as many cattle with bTB than was previously suspected (60,000 rather than 30,000). However, no matter how much testing and slaughter took place, bTB levels did not decrease. It was the lack of success bought about by cattle testing that turned the focus onto badgers, rather than looking at farming practices, biosecurity and herd movements in the livestock industry. Presentations in this section focused on computer systems and how they deal with current outbreaks. As in the previous session, no basic science was presented. BTB is found over 30% of Irelands land mass and is in 3% of all herds. If a herd experiences 2 herd breakdowns an epidemiological investigation is carried out in the form of a questionnaire, the end of which the vet in charge ascribes a cause of breakdown. In 25% of cases this attributed to badgers and the wildlife unit is called into to reduce the badger population with snares. Each year they spend 34 million Euros on bTB. 45% on compensation (full market value given), 7% on wildlife control, 22% on testing, 15% on supplies such as tuberculin and 2 million Euros is spent on research. They use 12,000 gamma interferon tests per year and 6% return positive. Pre-movement testing detected 7% of infected animals, but was deemed not cost effective when compared to annual testing. They also state that onward spread due to cattle movements was limited and that the problem was in the persistent herds being re-infected. Pre-movement testing was abandoned in 1996. 0.5 million movements were recorded on their computer system between 2003 and 2005. There is some genetic resistance to bTB in some bulls but not cows. The findings from the East Offaly and Four Areas projects were presented and these were compared with the RBCT. The Irish studies did show decreases in bTB after killing, but due to methodological discrepancies there is no scientific evidence that this was due to the culling. However, to the layman, the graphs and data presented do look as if culling made some positive difference to bTB incidence. Prof More went on to describe the RBCT and problems with the methodology. I asked the conference organizer why he had not asked Prof Bourne to attend and answer Prof More’s criticism. James O’Keeffe dismissed this by saying he talks to Prof Bourne all the time and that his work defends itself. I asked Prof More if he had followed scientific protocol by challenging the ISG Nature paper by submitting his comments to the Journal, and he replied that they ‘declined to publish’. This was the poorest section in terms of presentations and scientific input. The information of diet was descriptive and was to give insights into which food stuffs badger eat and which of these could be used as a bait for vaccine delivery. The reproduction of Irish badgers was compared to those in the UK. The problem with this research is that the Irish badgers come from disturbed populations that are below carrying capacity where as the data on the British badgers are from undisturbed populations at high density. There is a severe lack of ecological and behavioral knowledge about Irelands badgers and as the RBCT has shown, badger ecology has major implications when it comes to controlling the spread of bTB. The final presentation was by Paddy Sleeman on badgers in farmyards. This was particularly poor in terms of experimental design and analysis, in that it didn’t have any! He surveyed farmyards in winter and found badgers rarely used farmyards, based on the number of badger footprints he found. He concluded that badgers in Ireland rarely use farmyards, unlike in the UK. The role badgers apparently played in transmitting the disease was over emphasized. Numerous graphs were shown that showed trends of reduced bTB incidence in cattle after badgers were culled. There was no evidence to show that these declines were, or might have been caused by a raft of about 10 other measures that were introduced at the same time. The lack of scientific investigation in the Irish policy is astonishing and now bTB had plateau’d again over the last few years after a decline, they are having to think how they are going to gain further gains. A state vet showed typical farmland in Monaghan which borders NI, and a major TB hotspot. The hedges were broken, and farms highly fragmented, with farmers freely moving livestock between them. Over 300 herds were connected to NI. However, when I asked the vet about the poor biosecurity of these farms in terms of disease control he stated that nothing could be done because that’s the way farming was done in the area and it would cost too much. They much rather blame the badger. In fairness, he did say that if badgers had been removed and the herd kept breaking down he stopped the badger killing operations as they clearly were not the source! Its crazy. · Stop distance is 28cm. · 56% female, 44% male with average weight being 9.4kg. · 50% badger snared on thorax, 41% abdomen and 8% neck. I asked how many other species they caught and what did they do with them. They replied they didn’t collect that data, but will do when their computer systems are updated. They said they caught lots of dogs and some foxes and that they were ALL released. No mention was made of putting down injured non-target species, so I assume they simply released the injured animals too! There is also no closed season for setting snares. The Irish seem more advanced on developing a badger vaccine and plan to run field trials soon. The whole Irish experience is governed by their very powerful farming lobby. Farming accounts for 80% of GDP and as such any measures that makes life for farmers such as ensuring fences are properly maintained will be rejected. Instead they persecute the badger, and with no Animal welfare organizations in Ireland there is no opposition. 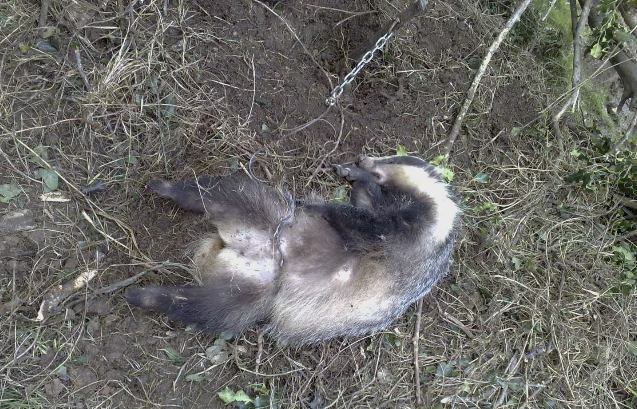 Badger culling, even by snares, is publicly accepted. It’s a disgrace, but a route they are likely to continue employing, no matter what their or anyone else’s science says! Dr. Richard Yarnell of Badger Trust (UK), Bernie Barrett and Damian Meagher (Badgerwatch) attended.